Julian Ravell tends to keep his cards close to his chest. He is a 21-year-old from Melbourne with a truly unique sense of style. He aspires to move into the creative fields of fashion, music, art or modelling and knows what he needs to do to get there – but is keeping mum about his plans until he’s there. 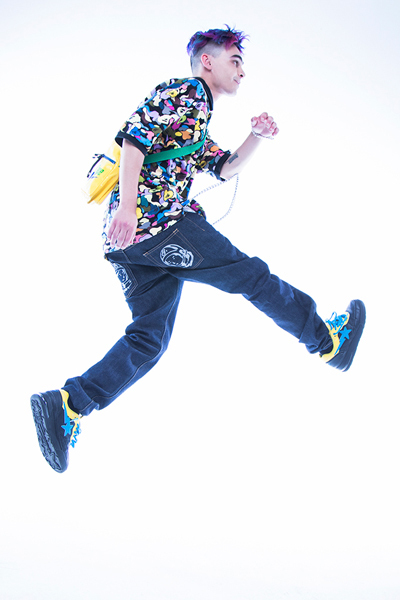 When he came into our Melbourne studio for a photo shoot, we were inspired by his colourful and experimental style. “What I wear reflects who I am”, Julian explains. He chooses not to follow trends, and instead wear clothes that push the boundaries. 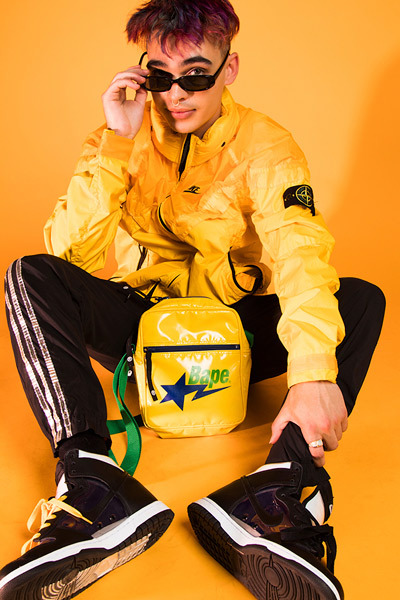 For as long as he can remember he has had a passion for sneakers, clothes, colours, art and music – and all of this is reflected in his portfolio. He cites his mum and uncle as fashion inspirations, describing how he thought that they ‘always looked so cool’. For his photo shoot he brought in pieces that he knew looked good and he wanted to get photographed in. Julian’s shoot had 3 key looks: urban, streetwear and casual. 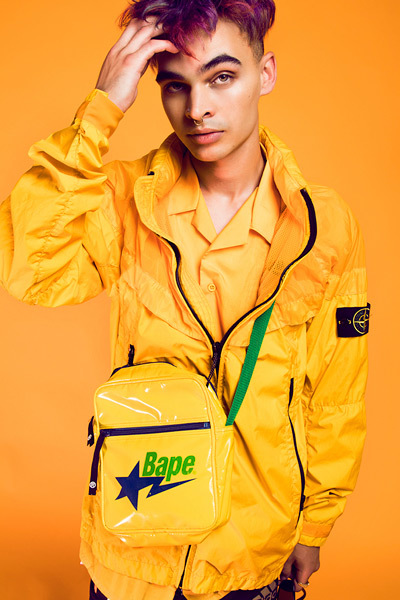 For his urban look he wore a matching canary yellow shirt, jacket and Bape bag. 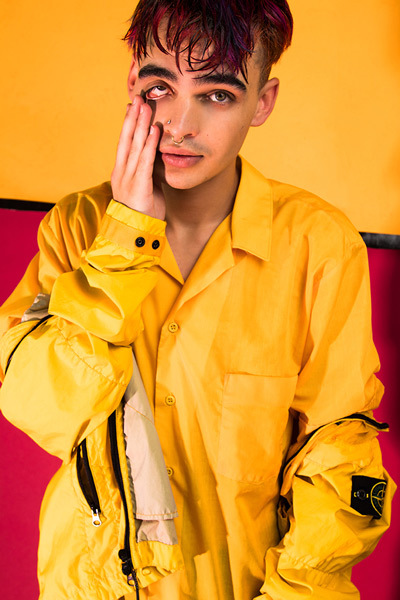 We love how Julian layered the jacket over the yellow shirt to create dimension in photographs. He allowed his originality to shine through in photos by wearing sneakers that had yellow laces on one shoe and black laces on the other. To complete the look, he added Adidas pants with metallic racing stripes. For his streetwear look Julian opted for a multi-coloured patterned shirt paired with a pair of jeans. His jeans had a twist though – white graphic prints on the front and back pockets to inject his own personality to an otherwise ordinary clothing piece. To add edge to this look he added some layered chain bracelets and pants chains. His sneakers were blue, yellow and black. For his casual look Julian kept it simple. He wore the same jeans from his streetwear look but changed his shirt to a simple white tee with a graphic print that matched his jeans. He again wore layered chain bracelets and accessorized with a classic gold ring. We love how the simplicity of the colours in this look allows his brightly coloured hair to be the star of the photos. We love Julian’s individuality and sense of style and can’t wait to see what he creates in the future!